Last year I wrote a blog about a serious new insect problem for landscapes in the Pacific Northwest. It was serious because rhododendrons and azaleas make up a large percentage of the plants in most gardeners landscape. The easy way to control the insect was with a systemic pesticide that harms bees. Many people were talking about removing all their susceptible plants rather than harm bees. Save bees and your azaleas and rhododendrons. How big a problem? 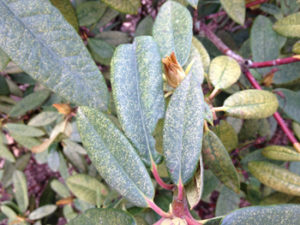 I have visited over thirty client landscapes in the Portland area since February – all the gardens but two had moderate to severe lace bug damage on rhodies and azaleas. I was already expecting the 2015 lace bug plant damage to be a huge problem for my clients. Robin Rosetta, Associate Professor, Extension Entomologist, OSU says the lace bug hatch is a full month early. This is very bad news unless you are prepared to start treating your plants now in mid-to-late April and early May. Lace bug eggs waiting to hatch. Photo by Robin Rosetta. Strong blasts of water should be applied to the back of the leaves to damage the wings of the lace bug while it is in its soft nymph stage. It can be a little difficult to hold your leaves steady to spray the back side, especially if it is a large rhododendron. Portland Nursery has something called a Bug Blaster Head for your hose. It’s easier to use and has a safer pressure for your plants’ leaves. It also has a wand attachment that would make it possible to treat a large rhododendron. Insecticidal soaps applied to the back of the leaves will also damage the lace bug nymph. These two methods are effective only while the nymph is soft. Once it turns into an adult, soaps won’t work and water spray will not remove embedded eggs. 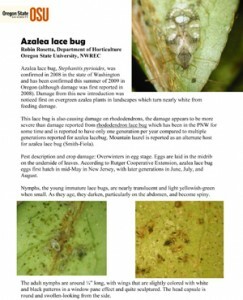 This may get confusing because the bad bugs that damage your plants are called lace bugs. I’m about to introduce you to a good bug that eats the bad bug. The good bugs are called green lace wings. If you don’t want to spray your plants because they are too big, there are too many plants or you want to work toward a long term solution; you need to purchase green lace wing larvae from March Biological or go to Portland Nursery to order through them. 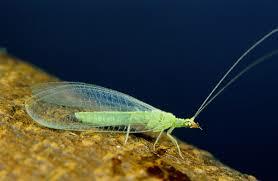 The green lace wing will eat the newly hatched lace bug and prevent the lace bug population from exploding. 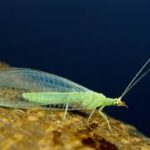 Getting green lace wings in a high population in your garden will help with the next one or two lace bug hatchings that we expect this year. My friend, Phil Thornburg, from Winterbloom has successfully diminished his damaging lace bug population. It took him a couple of years but he did it by applying green lace wings instead of pesticides. Plants in full sun seem to be the most damaged from lace bug. Basically they are stealing the green right out of the plants’ leaves and laying eggs that will hatch in another month adding insult to your already damaged plant. Remember to water your rhododendron and azaleas regularly this summer – they will need the extra support. 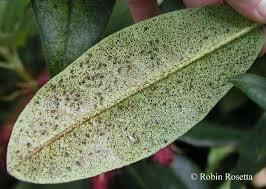 Question: What does lace bug on my rhododendrons have to do with bee colony collapse disorder? 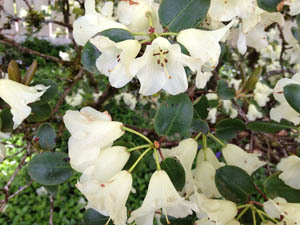 Rhododendron ‘Lutea’ in my client’s garden without any damage. A rare occurrence. Answer: Systemic drenches often contain imidacloprid. It’s popular because it’s easy, the chemical is suppose to be safer for mammals (so humans, rats, bats are pretty safe) but the spray will harm or kill bees or any insects who feed on the plant. For months afterwards bees take it back to the hive with the pollen so it’s not just harming one bee – it’s harming the colony. The time to treat your plants without harming the bees is now! A lot of my clients have asked me to help them with pruning their hydrangeas. This blog addresses mophead hydrangea pruning. Hydrangea pruning is simple and easy once you know the rules. 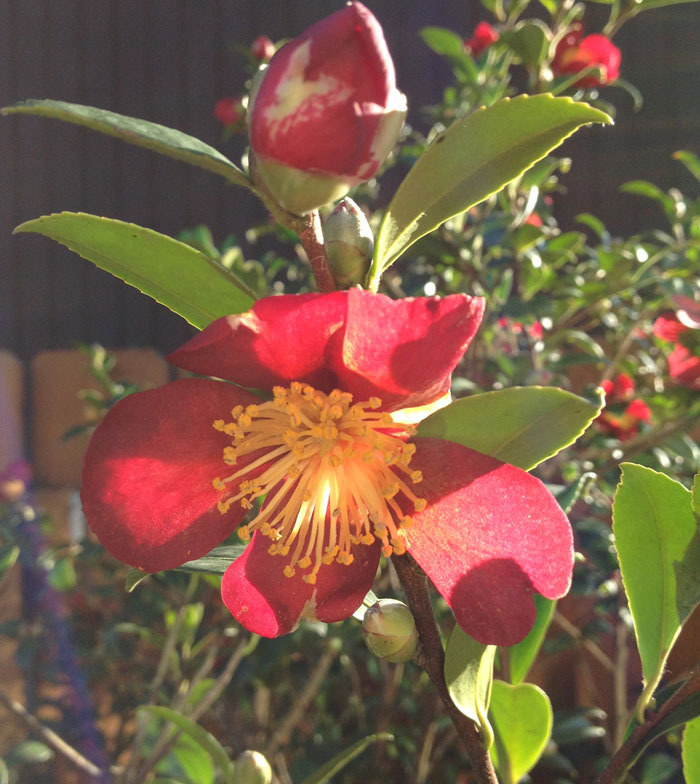 There is a link to a pruning video at the end of this blog produced by Cass Turnball of Plant Amnesty to help you feel more confident. There are 5 kinds of hydrangeas. 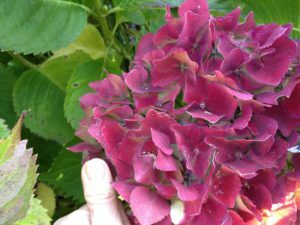 This blog only addresses mophead hydrangea pruning. 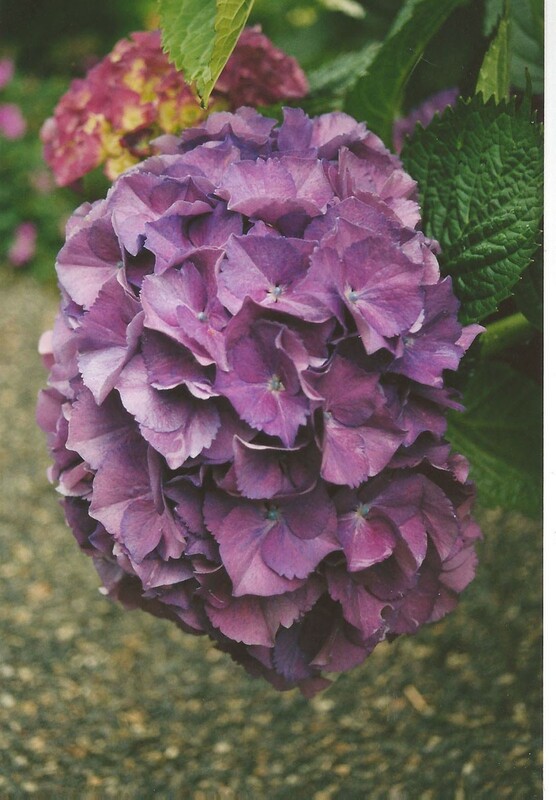 Why prune hydrangea at all? Why prune hydrangea plants at all? Like most plants, pruned hydrangea shrubs will have a better shape so they look good regardless of the flowering aspect. Many of us buy a hydrangea and think it will be 4’ x 4’. Over time, many varieties will grow to 7’ tall. It is very important to plant the right plant in the right place so you don’t have to be frustrated. There are some varieties that are going to mature at and be easily kept in the 4’ to 5’ range. We prune to achieve that height as well as a good shape. If you have a variety that wants to be 7 or even 8 feet tall every year even with proper pruning, the best answer is to remove the plant and buy a variety whose size works for your garden. Old Arts and Crafts homes with 6’ high foundations are perfect for the hydrangeas that are most cheerful at 7’. They don’t work as well for homes with a 12” foundation or a small yard.Another reason we prune is to remove stems that no longer flower. We prune hydrangeas in early to mid March in the Pacific NW. We start pruning our plants when they are about 3 years old or when you see the oldest stems are developing bark. Remove the oldest woody canes. On a young plant this might mean removing only 1 or 2 stems. We remove dead stems and canes and we deadhead flowers back to the first lateral buds. I think of these buds as rabbit ears. I love this task. I think it’s because I’m close to the ground and my soil smells good. I typically see 2 colors of buds at this time. The burgundy buds are just a bump on the stems. The tiny green buds (the rabbit ears) are such a vivid green. It says spring to me (and no it doesn’t rain every minute even in March). These are days when a wool sweater and a down vest are perfect for comfort. There is more to the story about hydrangea pruning. Occasionally there are individual plants that didn’t read the rule book. My garden coach client Mary followed the proper pruning techniques and she lost all her flowers for the year!! AAACK!! Her plants are 30 plus years old. Since that debacle Mary only deadheads her plants, again just down to the first buds and she removes old woody stems. Her plants always flower beautifully and are the focal point of her summer garden. I’ve never had this happen to me but I’ve heard about it often enough from other professionals to know that some plants are probably genetically different than others. If you don’t prune at all, your plants will get big and ungainly looking. A build up of deadwood may diminish their flowering capacity. 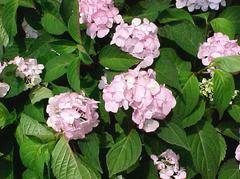 For a detailed lesson on pruning mop head hydrangeas, see this video. One More Reason to not over water this August. 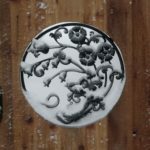 It will help keep your plants alive this winter. Plants that don’t get the message to slow down in late summer and fall, don’t go dormant in time for winter cold. Your plant needs dormancy to survive. Start now to protect them before old man winter arrives. 1. Do you over water in August? 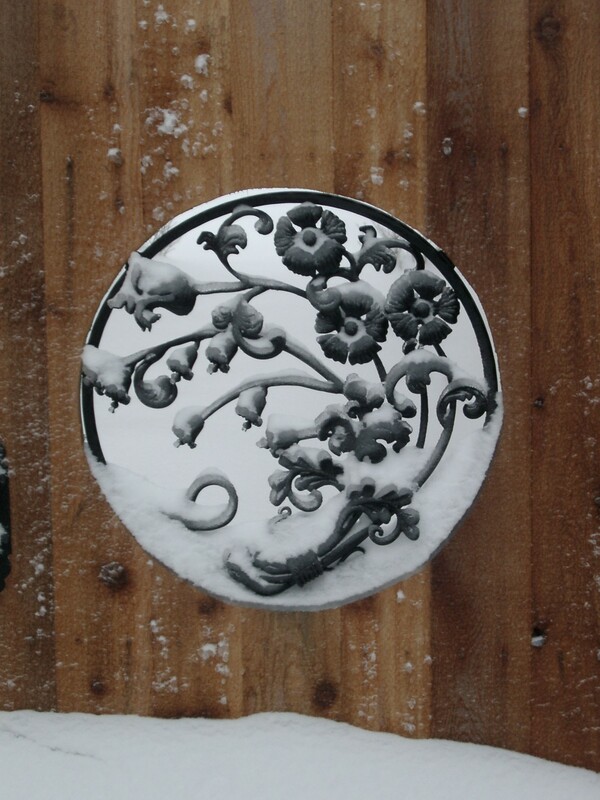 This is a biggie for a plant tombstone. Overwatering in summer and fall can cause plants to ignore the signals, such as shortened days that tell them to slow down. Try to learn how to water properly. TIP: A garden coach session could solve this problem for you! 2. Fertilizing plants that don’t need it causes lush growth and can interfere with dormancy. 80% of your plants don’t need any commercial fertilizer at all. The best practice is to place an inch or two of mulch (or compost) around your plants in spring and in early winter …. prior to Thanksgiving is a good time these days with our early freezing temps in the recent past. 3. 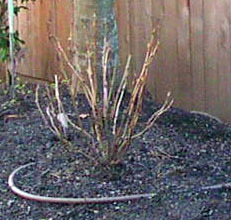 Severe pruning late in the summer or fall can signal plants to push growth. Signs of tender, new growth in fall or early winter is not a good thing. There are exceptions to this rule of course, nature isn’t fair and makes learning which plants are fine with “whacking” and which are not, takes time, concentration or a good teacher. 4. 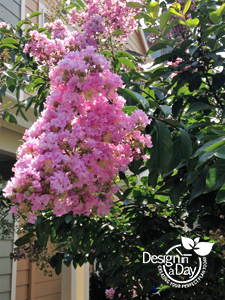 Plants that are considered drought tolerant are especially sensitive to over watering, fertilizing and severe pruning. Italian Cypress, Crape Myrtle and rosemary are good examples of plants that can be cold hardy here with knowledge based care. 5. Placement of Zone 7 and 8 plants into areas where the winter east wind will reach them is risky. Plant these evergreens such as large leaf hebes and New Zealand flax plants where the house or other plants will shield them. (Tiny leafed hebes are a better choice anyway). 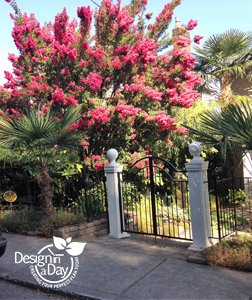 If you are in our East county and can’t shield plants from the winter wind from the Columbia Gorge, consider a different plant palette, plants that do well in Boise (zone 5) come to mind. Small leafed evergreens like dwarf conifers are a great choice. Plants that are deciduous (leaves fall off in winter) are completely dormant and therefore safe from the cold East wind. hatchings in a season and can do a lot of damage. The old rhododendron lace bug only hatched once a year in the Pacific Northwest. Systemic sprays and insecticides kill bees. It’s very important to use methods that don’t harm beneficial insects. Since drought and sun stressed plants are more susceptible, one method is to give these plants better care. Practically speaking, I would say irrigate even your old rhododendron trees that never seem to need a drop. Water them once a week during hot summer days as a preventative measure. Preventative methods are best. So far this spring, out of perhaps 60 gardens, I’ve only seen one garden that didn’t have these new pests. Preventative methods I’m recommending are building up green lace wings in your garden preferably before you have the pest or when you see that you do have it and better watering. Using green lace wings, a beneficial insect, is another effective way to combat lace bug. You can purchase green lace wing larvae and apply them near your affected rhododendron, the idea is to build a population of green lace wings in your garden from March Biological in Sherwood, Oregon. Ladybug Indoor Gardens in Medford, Oregon can also be reached at: 541-618-4459 541-618-4459. Please note, green lace wings are pretty, they remind me of Tinker Bell, sort of. Using the green lace wings does work, as my associate and friend Phil Thornburg, (Winterbloom) can attest. It took about 3 years but his plants have fully recovered and he has a nice population of the lovely green lace wings in his gardens as a bonus. Their latin name is Chrysopididae and you can look them up on Wikipedia for more details. The chemical sprays I have seen recommended for lace bug are harmful to beneficials such as honeybees. 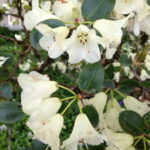 My recommendations are purchase and apply green lace wings and irrigate azaleas and rhododendrons weekly in the summer. This will allow us to wait until a honeybee friendly solution to help us protect our plants is found. Azalea lace bugs are here to stay. For more details, download the informative Oregon State University flyer.